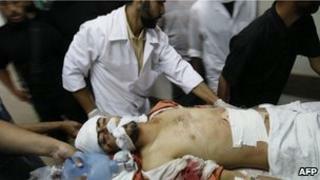 A Palestinian militant has been killed and seven other people wounded when Israeli troops opened fire in northern Gaza. One of the wounded was a 10-year-old girl, reports said. Palestinian medical sources told reporters three of the wounded were in a critical condition. Witnesses said a group of armed men were approaching the area near the boundary with Israel near Beit Hanoun. News agency Reuters reported that a militant group, which it did not name in the report, had confirmed to them the dead man was one of their members. There have been sporadic confrontations between militants and Israeli troops since the Israeli Operation Cast Lead assault on Gaza in 2008 and 2009.